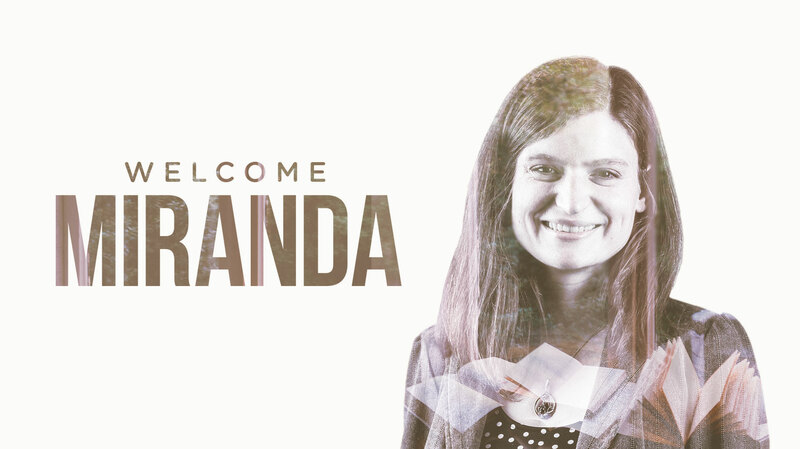 Miranda is the newest addition to the Murmur team (and boy are we lucky to have her!). She bowled us over in her interview and continues to impress us with her wordsmithery, smarts, and unquenchable thirst for knowledge. Let’s learn a little bit about what makes her tick! So you were an English professor before this. Why the career change? That’s such an immensely complicated question and to answer it fully I’d have to write you a couple essays on the current state of higher education, the academic job market, and the challenge of balancing creative writing with teaching and a teaching-focused career with life in general. I won’t do that here though, promise. Here, I’ll just say that, I started feeling the need to craft a career that better met my longer-term needs for professional growth, creativity, and work-life balance. I also wanted to be sure I was focusing my career in a direction that left me space for my own creative projects. And the opportunity to work at Murmur was just too wonderful to even think about passing up. It’s such an exciting time to be working in a creative field in the Northwest. There’s so much energy and excitement in this industry. I feel very lucky to be able to be a part of that. And I still get to teach the occasional writing class. So I feel like I sort of get to have the best of both worlds. Oxford comma: Yay or Nay? Yay! Yay! Yay! It makes life so much clearer. How could anyone not love the Oxford comma? What gets you excited about working at Murmur Creative? The people. Murmur has such a wonderful welcoming team and everyone is so good at what they do. I’m excited to come into work every morning. I feel like the culture here is supportive of everyone’s individual interests and talents. There’s a sense of curiosity and exploration in the air. Everyone’s always looking for ways to learn new things. And there’s a great attention to the details of craft and a dedication to creating the best possible work. It’s very inspiring. I feel like I have at least one super embarrassing moment every single day. I tend to be pretty clumsy (it is not uncommon to see me walking into poles). But one that stands out is from this winter when everything was iced over and I was walking down the completely frozen sidewalk. So, of course, I slipped and fell right in front of a whole bunch of people who were asking if I was ok and I was all, “Totally fine. Didn’t happen. Nothing to see here.” And I picked myself up and brushed off the snow and limped back home with some badly sprained pride. But to understand how truly embarrassing that fall was, you have to know that I grew up in the Midwest. I’m supposed to be used to ice and snow. I’m supposed to be able to handle it. Of course, back in the Midwest, I was always slipping on ice, but that wasn’t in front of all you West Coasters. When I show how much I can’t handle winter here, I’m an embarrassment to my whole region. I told one of my Midwestern friends this story and she said that it was so mortifying I should never ever ever share it again. You’re a reader and a writer. What are 3 favorite books you’ve read lately? We Are Okay by Nina LaCouer: It’s a YA novel that does everything you wouldn’t think a YA novel would. It’s very internal, all about grief, really interested in the effects of place on people’s psychology, and absolutely gorgeously written. It’s also the most beautiful love story. A Wild Swan by Michael Cunningham: I recently reread this one yet again. It’s a book of adapted fairy tales by one of my favorite authors. Cunningham’s takes on these tales are very character driven, very internal, very lyrical, and very contemporary. The illustrations by Yuko Shimizu are absolutely gorgeous. It’s just an all around beautiful book. Vita and Virginia by Eileen Atkins: I just started reading this play based on the letters written between Virginia Woolf and Vita Sackville-West. I’m a huge Virginia Woolf fan girl so it’s great to see these letters (which are amazing) and this relationship (which inspired Woolf’s novel Orlando) as a play by Eileen Atkins (who is such an incredible, legendary, theatrical talent). The play is being made into a movie right now and I can’t even contain my extremely nerdy excitement about that. If you could be any mythical creature what would you be? Probably a dryad. I could live in a forest and hang out with trees all day and just be generally magical. Cats. My cats have started doing this meowing thing at me every morning before I leave my apartment. They know exactly how to manipulate me and can usually get me to stick around for at least an extra five minutes that way. As you can probably guess, I’m also very easily bribed with books. Fortunately, my cats have not yet discovered this tactic. What about your life makes you feel proud? I’m going to get very sentimental for a moment here and say my relationship with my wife. We’ve been together for a really long time and she’s amazing and I feel like things just keep getting better. It makes me very proud to know that such a remarkable, wonderful, loving, super-smart, talented person, wants me as a such a central part of her life. I’m very proud of the little corner of the world that we’ve built, and keep building, together. What space/place in Portland inspires you? So many places! Powells. The Lone Fir Cemetery. The Willamette. Walking over the Hawthorne Bridge. Every single coffee shop. Knowing there are still so many amazing Portland places to discover. I’m endlessly inspired by Portland. Lastly, would you rather fight one horse-sized duck or 100 duck-sized horses? With a giant bag of bread crumbs, I think I might have a chance with that horse-sized duck. I’m not much of a fighter, though, so without the bread crumbs, I’d take the duck-sized horses. I think that would be a pretty amazing sight to see before being trampled.